We noted before the release of the new Apple products that it often pays to wait a week before buying Apple’s new products. Not only don’t you get “the first ones off the line”, but prices drop significantly over the first week. A number of Apple Authorized Retailers/affiliates are new selling Apple’s new MacBook Airs and Minis at prices up to $100 lower than Apple. MacMall and Amazon appear to be the lowest. Update: The MacMall deals are over. And the 2.00GHz Core i7 Mac mini Server is lowest – $959.99 at MacConnection. 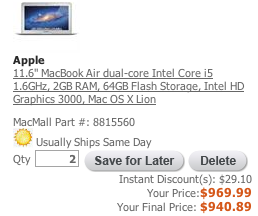 Note: Best Buy will often match these prices.